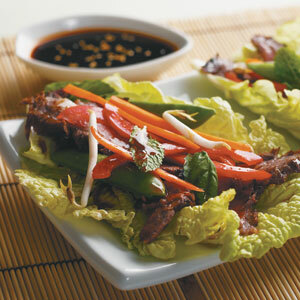 This Asian-inspired wrap illustrates the versatility of flank steak — both in terms of flavor and presentation. Instead of making an ordinary wrap or salad, serve slices of the beef in large lettuce leaves and add fresh, crisp vegetables and herbs. Marinating flank less than 1 hour won’t do much. But if you leave it more than 4 hours, the acids will start to break down muscle fibers and make them mushy. Combine soy sauce, brown sugar, garlic, gingerroot, vinegar, oil, ketchup, and pepper flakes in a resealable plastic bag. Score steak by making shallow (1/8-inch-thick) cuts in a criss-cross pattern on the surface. Add steak to bag, seal, and chill at least 2 hours. Remove steak, reserving marinade for the sauce; pat steak dry. Boil marinade in a saucepan until thick, about 10 minutes; strain. Set sauce aside. Grill steak uncovered over direct heat about 6 minutes; flip and baste with sauce. Grill steak 5 minutes, then flip and baste again. Allow steak to rest 5 minutes, then slice into thin strips. Arrange cabbage, bean sprouts, bell pepper, carrot, sugar snap peas, mint, and basil in separate bowls. To serve, have each person assemble their own wrap: Start with a cabbage leaf, add some beef and vegetables, and drizzle with the sauce. Strain and discard the solids after reducing the sauce to about a 1/2 cup. Build the wrap with the beef and any combination of the vegetables you like. Only a little of this intensely flavored teriyaki sauce is needed on each wrap.